Macy’s Union Square transforms into a space-inspired floral fantasy world during its 73rd annual Macy’s Flower Show. The annual Macy’s Flower Show is a stunning celebration of flowers, food, art and music. 2019’s season’s “Journey to Paradisios” transports fans into a multi-dimensional world of space, adventure, and discovery through florals and eccentrically landscaped gardens, Journey to Paradisios celebrates the wonder and mystery of the cosmos. FREE – RSVP may be required for special events. Please check individual events for more info. 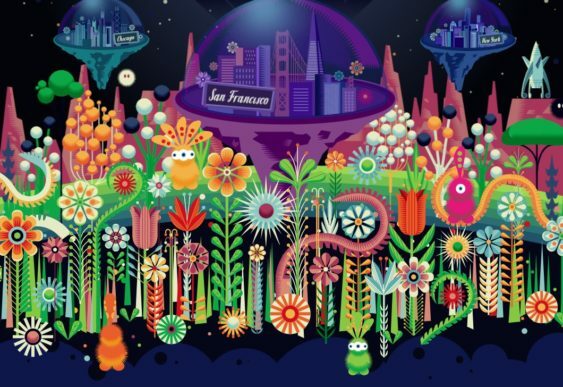 Celebrating discovery, color and wonder, Macy’s Flower Show will blast off into the cosmos with more than 5,000 types of plants, trees and flowers depicting various outer space themes. They will be dazzled by a space ship as it launches into outer space through the roof into the star-filled night sky. Start your visit with a free guided tour of the Flower Show. Reserve a tour online or call (415) 954-6271 to make a reservation. Tours are complimentary and include a 10% Visitor’s Savings Pass. While you’re there, show your BART ticket, Clipper card or mention BARTable and receive a free commemorative Flower Show pin and visit on a weekday to receive a free one-way weekend BART ticket (while supplies last, one per customer from March 22-April 7, 2019). Join at Macy’s and celebrate the 30th anniversary of The Sak. Check out the latest handbags from The Sak, enjoy light bites, and learn to crochet during a special hands-on workshop with crochet street artist London Kaye. Learn tips and tricks from the pro and receive all the supplies to make your own crochet mini pouch. Plus, spend $75 or more at The Sak and receive a complimentary hand-crocheted coin purse, a $39 value. London Kaye is a celebrated street artist based in Los Angeles, California. Her unique use of crochet to create art pieces made entirely of yarn has brought smiles to communities around the world and has allowed London to create a business out of something handmade. Crochet workshops will be held at 4 pm and 6 pm. Seating is limited. RSVP is required.